The January 2019 edition of Missionary Vision is available in the gallery section. This edition includes an article on Rev John Hanna, and an update on the Liberia radio challenges. 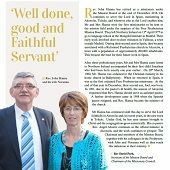 Also included, are reports from David and Rachel McAuley in Kenya, Rev & Mrs Baxter on their return from Liberia, and Noel Shields on passing his first year as a home evangelist.